It is thought that there is resident pod of around 30 Bottlenose dolphins that reside in the area off the cliffs of Los Gigantes. Many more transient pods pass through the area on migration at different points of the year. These 30 dolphins are set-up in a fission fusion societies in which individuals associate in small parties that frequently change in composition and behaviour. For example groups can stay stable for relatively long periods of time, or rest for hours such as bachelor gatherings of males searching for females to mate with or foraging parties, which can take them from the hub of dolphin activity in Los Gigantes, all the way down the SW coast and possibly even further afield. These animals are capable of travelling 100km a day, so they could be found anywhere. ​Been on a whale watching trip in Tenerife? Your Finshots could help us. 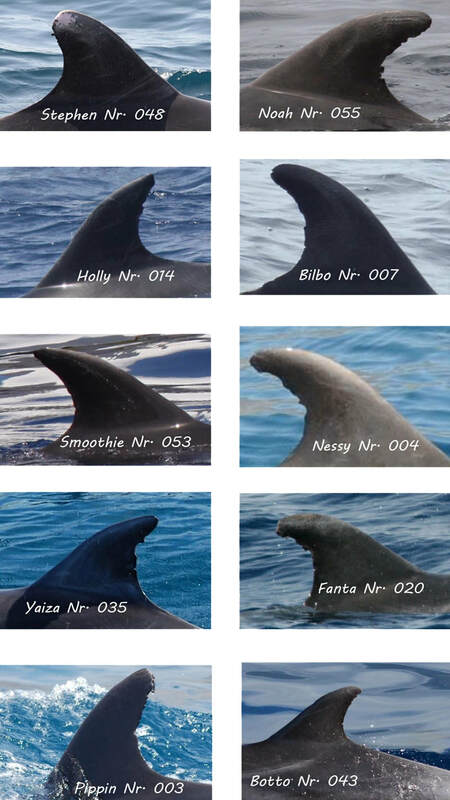 If you have seen any of these Bottlenose dolphins or their family members send us your photos of their dorsal fins so we can add the our fin ID database.